Reengagement email campaigns should always be a major consideration when building a marketing program. While we all hope that our customers will engage with our brand consistently over time, some may stray from the path leading to conversion and brand loyalty. Being realistic about and cognizant of the threat of customer churn upfront can allow you and your team to create a strong strategy for reengaging those who have abandoned the journey you’d like them to take. While email is absolutely imperative when retargeting customers, there is certainly no one-size-fits-all strategy to execute reengagement across businesses and verticals. And, when it comes to financial services identifying tactics to connect with disengaged customers through their inbox can be particularly challenging. Below you’ll find three great strategies to employ when building your next financial services reengagement campaign. As digital natives, Millennials may surpass other generations in terms of their ability to engage with finance digitally. However, according to PWC many millennials lack the financial literacy to make money work in their favor. According to their research, less than 24% of millennials demonstrated basic financial knowledge and 34% were very unsatisfied with their current financial situation. Smart marketers can fill this gap by using emails to provide or promote educational content—for free. If you don’t have a financial education component within your digital properties already, now is the time to add one. For many managing personal finances can feel overwhelming and intimidating. Most customers won’t be able to talk about the intricacies of amortization or the details of cryptocurrency but can speak to how they spend money day-to-day: $75 on groceries, $20 for dinner with friends etc. Using these every day and yet inherently financial situations is a great way to reconnect with a customer who doesn’t feel particularly passionate about their financial institution. Take a look below at how Chase successfully executes this strategy by showing a group of friends eating dinner. 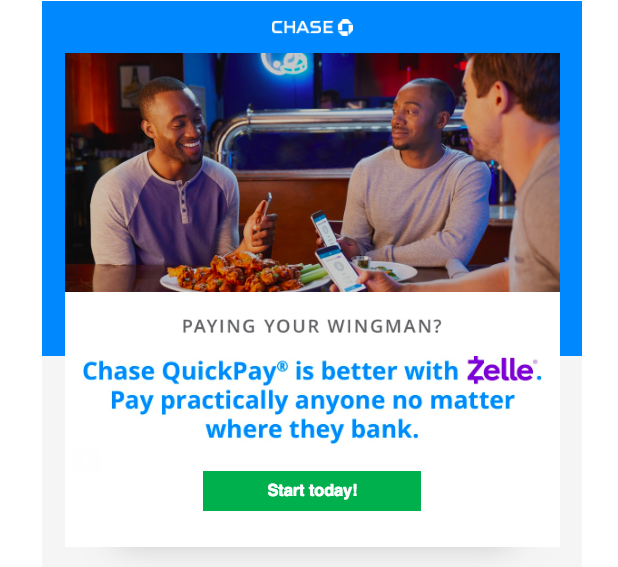 While finances can seem daunting, the idea of transferring money to a friend so close that you trust him to be your wingman is relatable and lighthearted. Financial brands that excel at content personalization serve content that is hyper-personalized and segmented. In order to send these types of data-driven emails you should consider investing in third-party data and using responsive design. Investing in third-party data will allow you to email offers, images, headlines, and other content relevant to your customer’s life stage (did they just graduate college? buy a car? have a child?) and demographic (are they under 25? at midlife? ready to retire?). Using responsive, mobile-friendly email design can allow you to successfully engage with your customer wherever they are. By communicating with your customer even when they’re on the bus or at the mall your ability to reconnect grows exponentially. While there is no shortage of email reengagement strategies, these 3 offer a great jumping-off-point when brainstorming your next financial services reengagement campaign. Learn about 4 marketing strategies traditional financial institutions can apply to remain relevant in an industry that has been disrupted by technology.